Looks like an 8 storey condo/lofts building on Broadview, just south of Queen Street East. Looks great, more MOZO influence. Toronto's embryonic Brooklyn is shaping up very nicely. Any idea on whether any part of this building are converted lofts. From the website it seems like its the same design team behind the Toy Factory Lofts. Received this image in my in-box today. "Refined classic loft living in Queen East. Lofts and penthouses from $199,900." Received an email - floorplans are online. No features and finishes sheet though. Looks good. But how will it sell? If Mr Condo himself, BJL, had trouble selling two projects nearby--the Flat Iron and Work Lofts, why does this developer have confidence in the market? 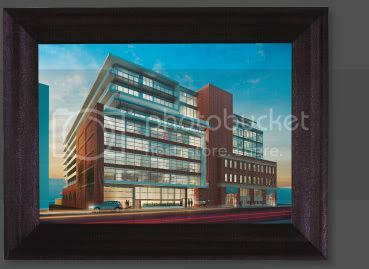 Leslieville lofts has been cancelled so will those who purchased there consider buying units in Ninety since it's in the same area; or will BJL push them to his own projects further east at Flat Iron and Work Lofts? Anyone have pricing for this project? Or anything in the leslieville area for that matter? The exisiting building will remain commercial. They are applying for additional res floors above the exisiting building, but the bulk of the condo will be a new building on the south side (current parking lot and circus school). Developers are awesome.... good value product - very urban and young. When it comes to location, a condo called The Ninety has it 100 per cent covered. The site of the nine-storey, 222-unit building to be built at 90 Broadview, just south of Queen, is minutes by car or transit to the heart of the city. It is just as close to major arteries, a few steps to public transit in the heart of the Queen St. E. Broadview Village and a hop, skip and jump to vibrant Leslieville which flows into the Beach. It's an area in transition and starting to attract a lot of attention, offering an eclectic range of services, offbeat and traditional shops and stores, restaurants and a just-as-interesting range of local residents. The plans for The Ninety also offer variety as well as some unique features for a condo that is so close to the core â€“ like a courtyard. Because of its U-shape (the open portion will face west), about half of The Ninety's lofts and penthouses will overlook the private green abode, which will encompass about 421 square metres. "The planters will have trees and sitting areas will have seating and tables," says Brad Lamb, of Brad J. Lamb Realty, the broker for the project developed by Harhay Construction Management Ltd. (Zen Lofts, GlÃ¤s) with Core Architects. "What is great about this space is that it is contiguous to the indoor amenity space on the ground floor â€“ which will create a really functional amenity for unit owners to take advantage of." The Ninety will include an existing industrial building constructed in 1933 â€“ the 3.5-storey Coca Cola bottling plant. "It is a beautiful building with large columns and capitals," says Lamb. "This building will be retained and incorporated into the project which will definitely add character and a warehouse-loft style to the development." The Ninety website refers to the use of "clay-toned brick and distinctive warehouse mullion grid pattern" to ensure a "comfortable fit within the neighbourhood." Because of the existing building component, The Ninety cannot offer a Tarion warranty but Lamb said there will be a similar warranty offered to buyers. The lobby will also have a unique characteristic â€“ an all-black colour scheme featuring strong textural contrasts, high gloss lacquers, marble, herringbone-laid porcelain tile and bright metallic gold details. Lobby furnishings will be modern. The lofts range in size and price depending on location within the building and the design of the floor plans. As a sample, a 626-square-foot suite, one bedroom plus den, with a balcony, is selling for $254,900. An 889-square-foot two-bedroom suite with balcony has a $344,400 price tag. All units come with six appliances including stainless steel fridge and stove and a white stackable washer/dryer. Ceiling heights in principal rooms are nine-to-10 feet. Standard finishes include engineered hardwood throughout (except the bathroom and laundry room), stone counterop in the kitchen, European-style kitchen cabinetry, porcelain floor tile in the bathroom, rain-style showerhead, pressure-balanced mixing valve in bathtub and shower, gas barbecue connection on terraces and balconies, opaque glass sliding doors in bedrooms, double-pane thermal windows with low-e gas, individually controlled heating and air conditioning system with heat pump and high-speed wiring. For more information, visit the Ninety website or call 647-344-4376. Construction is expected to begin in the fall of 2009 with an expected December 2010 occupancy.